All businesses today depend on internet connectivity, no matter what your specialty. If you happen to be involved in e-commerce, multimedia, or a number of other endeavors, the increasing demands for bandwidth that is reliable and secure. First Communications can design and deliver a tailored solution to provide access that delivers the performance you need at a price you can afford, with the flexibility to upgrade as your business grows. Connectivity can be delivered with several technologies, including T1 and Ethernet. Both are proven technologies that are widely utilized, but each has certain advantages over the other. Ethernet has much higher bandwidth, is highly scalable, and is simpler technology. T1 service is more widely available, and initially less expensive to provide service, and is good solution for smaller businesses that don’t need to scale bandwidth. The technology experts at First Communications can help you select the best connectivity solution for your business. Upgrade to the latest technology with simple and scalable Ethernet, delivered via Fiber or Copper. If your business needs more bandwidth, First Communications has the solution that you need for a price that your business can afford. Cloud Applications need lots of Bandwidth. Fast, symmetrical access with speeds up to 1Gbps. 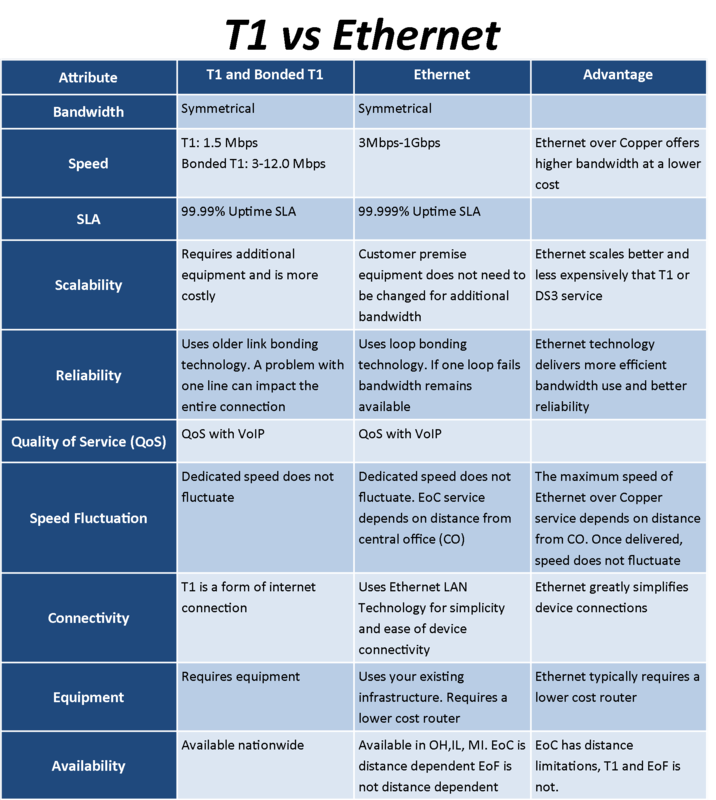 Ethernet connnectivity is up to 50% less expensive than comparable T1 or DS3 service. Enables high quality for mission critical business applications like Voice over IP (VoIP) , credit card transactions, and mission critical enterprise applications. Easy Grows with your business, and doesn’t require additional equipment and capital expenditures. Guaranteed 99.99% network availability backed by a robust SLA. No need to purchase expensive equipment or replace circuits when upgrading service. Our experienced and responsive technical experts offer superior customer support whenever you need it. Trusted technology that is available everywhere. Outgrown Your DSL or Cable Broadband? Upgrade to the latest technology. Cloud applications need lots of bandwidth. T1 offers fast, symmetrical access with speeds up to 1.5 to 12 Mbps. Your dedicated, highly experienced Sales Engineer will perform a thorough assessment of your current environment and service needs, and will work with you to design a customized solution. Your dedicated and experienced Project Coordinator will guide you through the implementation process, so that your custom designed solution is installed in a seamless and professional manner. After installation, your dedicated Customer Relationship Manager (CRM) will serve as a single point of contact. As your business and network needs grow, your CRM can assist with configuration changes, the addition of new locations, or any other support you might need.